Bring together an epic band and rock to the top in Rockband Manager! 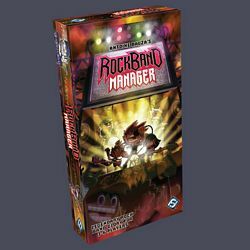 In the card game Rockband Manager, 3-6 players attempt to guide their bands to rock stardom. The manager who hires the best musicians, books the biggest gigs, and cuts the highest selling album wins the game. Since there are multiple paths to glory in this game, players have to develop their own strategies for success. Collect new gear for your band to help establish them as rock powerhouses. Throw a cheap shot at your rival managers in an effort to get ahead. Establish connections to industry insiders to ensure your band's success. In this fast-paced game anything goes, and only one band can become rock legends.